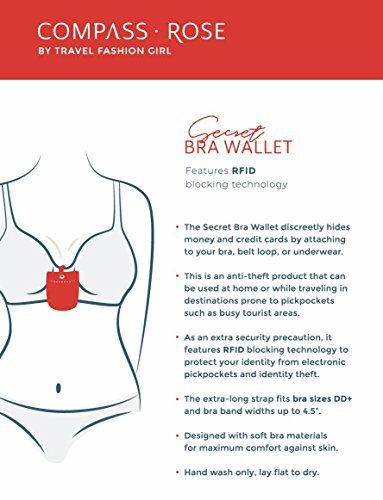 WHAT IS A SECRET BRA WALLET? 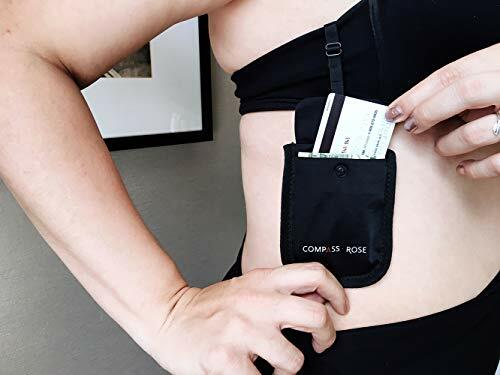 The Secret Bra Wallet discreetly hides money and credit cards by attaching to your bra, belt loop, or underwear. 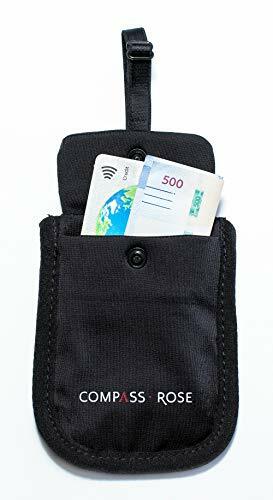 Should your purse get stolen or lost, you will have the bulk of your cash and cards securely stored underneath your clothing so you’re never left unprepared. You can use this bra stash at home or while traveling and it can also be used for festivals, for a night out, or when you don’t feel like carrying a purse. It has an extra long adjustable strap to accommodate a range of bra band sizes. 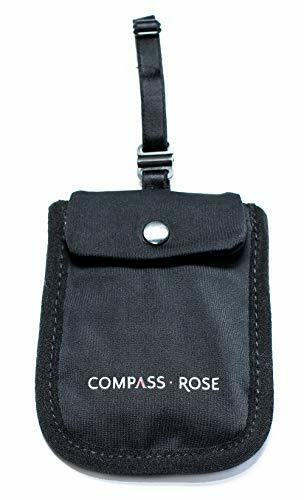 Whether you have an A cup or a DD+ cup, the Compass Rose Secret Bra Wallet is made for you. In the above images, we show two ways to wear the bra stash. Tuck it in underneath your bra for extra security – that’s how we wear ours and how we recommend you wear it, too. The Secret Bra Wallet does not replace your regular wallet. It acts as a secondary, hidden storage for money and cards. Store extra cash and cards in the bra wallet while placing the estimated amount of cash you’ll need for the day in you regular wallet. If you need access to the items stored in the bra wallet, move to a discreet location and remove the items comfortably and privately. This tactic also helps keep your money safe when you need to carry large amounts of cash. 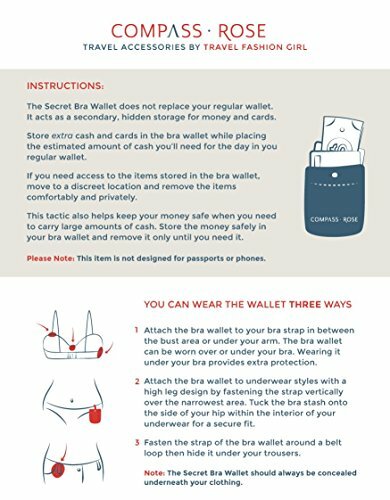 Store the money safely in your bra wallet and remove it only until you need it. As a bonus, the bra wallet has built-in RFID blocking material to protect your credit cards from digital theft. NOTE: This item is NOT designed for passports or phones. SECRET WALLET designed by blogger, Travel Fashion Girl. 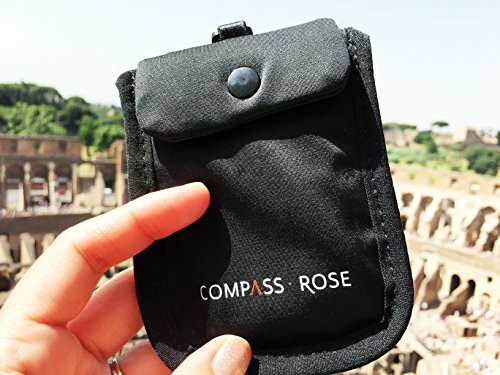 It keeps your belongings safe from pickpockets while traveling abroad. RFID PROTECTION from digital theft with built-in RFID blocking materials. FITS BRA CUP SIZES A – DD+ and bra band widths up to 4″. DISCREET SAFETY attach to bra strap, bra band, underwear, or belt loop and wear underneath clothing.